I saw a post about Smoked Maple Bourbon by Knob Creek and I was inspired to bake it into some kind of concoction. Obviously Bacon had to be invited to this party. I settled on a cheap-o, friendly skies sized bottle of Maple Jim Beam. Which, I imagine, is just how a shot of maple syrup lit on fire would taste. So, I had the bourbon and the Bacon and just needed to decide how to combine them . 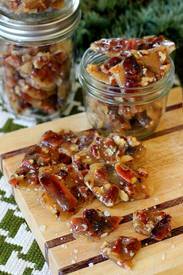 Then it struck me: a bourbon Bacon brittle recipe.